The Fondazione delle Arti – Venezia has been created and supported by cultural organisations and partners who identify with some of the guiding principles that, in the past, created the renown of the Serenissima. – Developing a multichannel communications strategy directed at the most culturally aware tourists, and a kind of stamp of authenticity check, recognition and guarantee dedicated to promoting high-profile events in the city. – Creating an International Club to bring together the cultural and economic elite with a strong interest in Venice, and using it as a focus for artistic events linked to the preservation of the city’s historical and cultural heritage. 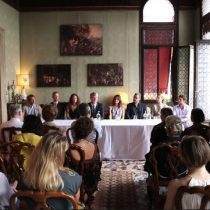 With the support of the Fondazione delle Arti – Venezia, the Club delle Arti selects and organizes events that unveil Venice’s soul. The Club delle Arti offers new cultural, personal, and creative horizons. The Palazzetto Pisani, in the heart of Venice, is the perfect location for the Club delle Arti.